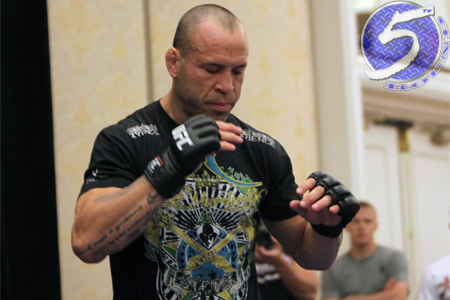 Wanderlei Silva (pictured) clocks 49 professional fights this Saturday when he battles Brian Stann at UFC on FUEL TV 8. Fighting is in Silva’s blood. In fact, scrapping is all he knows. That’s why the 36-year-old still hasn’t considered, at least publicly, that the end of his illustrious career is drawing near. Despite losing seven of his last 10 bouts, four of which resulted in his unconscious state on the canvas, Silva simply responded “not yet” when asked during Wednesday’s pre-fight press conference if he was contemplating retirement. UFC president Dana White suggested he would have to force “The Axe Murderer” to hang up his MMA gloves once and for all after getting put to sleep by Chris Leben at UFC 132. However, the slugger managed to convince White to arrange a shootout against Cung Le. Silva proceeded to post a TKO victory over Le, who was nearly 40 years of age at the time. Instead of calling it quits off a win, the fighter in him was convinced he could continue. The Brazilian was then granted a rematch with Rich Franklin and lost. That leads us to Saturday, where Silva meets a man who’s admitted the former Pride champion inspired him to start the sport of MMA. Stann is more than a 2-to-1 odds-on favorite to send Silva on another losing streak. Silva owns an impressive a 34-12-1 (1 NC) resume, with 24 of his victories coming via some form of knockout. Father Time, however, remains undefeated.